Strawberry Crème Brûlée's blooms are intriguingly diverse. They will appear in dark pink and mature to creamy salmon-pink with burgundy flecks, so you're likely to have several different bloom colors at a time. They also vary from single blooms to fully double, 24+ petal blooms; most appearing as semi-doubles. This Itoh peony blooms like crazy. It averages 3-4 flowers per stem, although sometimes it'll get up to five or six. With most types of peonies, ants are attracted to the nectar around peony buds. While they are not harmful to the plant, and can be fun to watch dancing across the buds, it can be frustrating if the ants venture into your home. If that has been keeping you from putting peonies in your garden, try this variety. 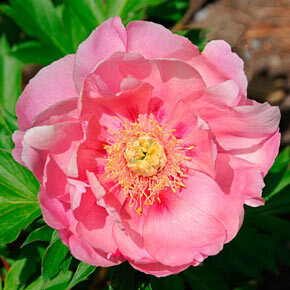 As an Itoh peony, it doesn't produce that nectar, so you won't have to worry about ants. Peonies can last for decades in the garden, so Strawberry Crème Brûlée makes a great foundation planting. You could also put it in a perennial border or cutting garden. Flower Form: Large semi to fully double flowers. 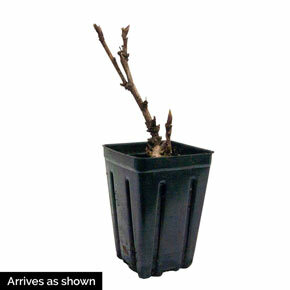 Foliage Type: This selection forms an upright bush of lush green leave.